Madelyn Ann McDonald possibly photographed before a high school dance. She is a wearing what looks to be a formal strapless polka-dot dress and holding a flower arrangement. There no labels or dates on the photograph. Madelyn was identified by her siblings. 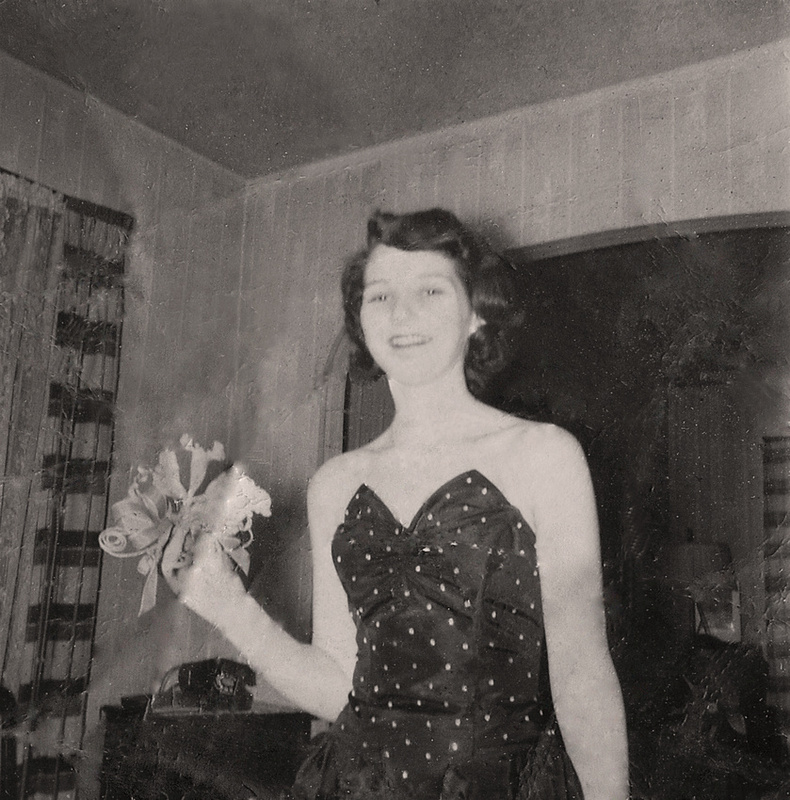 If taken before a high school dance the latest the photograph could have been taken is the spring of 1950 when she was 18 years old. The photograph could also have been taken in the late 1940's. The photograph would have been taken in Erie, Erie County, Pennsylvania. This photograph was included in the Frances Philomena Selker Collection. Frances Philomena Guth appears to have passed the photographs down to her daughter Frances Philomena Selker. Frances' daughter Mary Eugina McDonald ended up with her mother's photo collections which is time were handed down to me. Photographer Unknown. Editing and digital restoration by Michelle M. Murosky. Madelyn Ann McDonald, affectionately known as Aunt Midge, is my Great Aunt. Her sister Mary Eugenia McDonald is my paternal grandmother.